School district officials in southern B.C. are investigating a class assignment that's left many parents feeling unfairly maligned for their political beliefs. 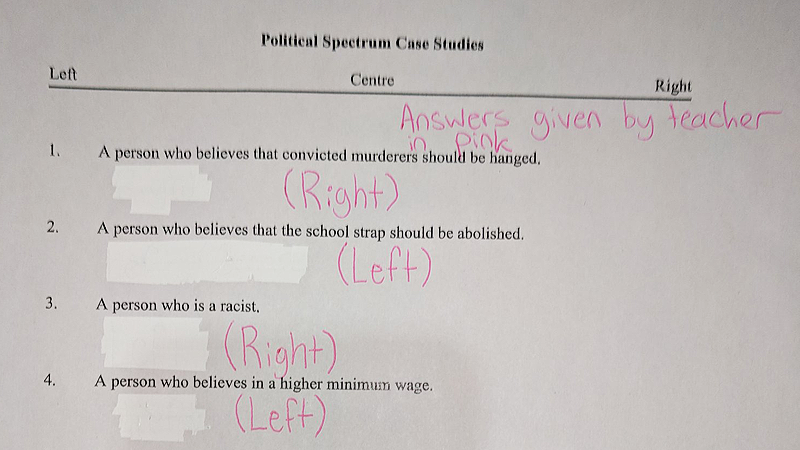 Students at Valleyview Secondary School in Kamloops were shown a series of political views and asked to categorize them as either "Left" or "Right," according to one outraged father who shared a picture of the assignment on his Facebook page this week. The questions ranged from "A person who believes in a higher minimum wage" to "A person who is racist." The answer to the latter was "Right," according to the Facebook post. "This is 1984-esque propaganda at its very worst," poster Matt DeFouw wrote. "On this single page, there is more bigotry, divisive evil, lies, and malice than I could even imagine as a conspiracy theory or piece of political satire." Other questions include "A person who believes that the school strap should be abolished," "A person who believes that convicted murderers should be hanged," and "A person who believes that women should stay home and be mothers." The father alleges the answers were “Left,” “Right” and “Right,” respectively. The worksheet pictured in DeFouw's post is labelled "Political Spectrum Case Studies," and the Kamloops-Thompson School District said it was used in a Grade 10 Social Studies class. Asst. Supt. Bill Hamblett told CTV News students in the class are learning about different world views and perspectives – an admittedly difficult subject – but that the assignment clearly missed the mark. "The worksheet itself, as the teacher realizes, was not balanced and an oversimplification of a very complex topic, and that will need some revisiting with the students to explore the topic more thoroughly," Hamblett said. The district is still working to determine the context of the assignment and how it was presented, however. Some online commenters suggested it was actually part of a discussion about fascism vs. communism as political extremes, though Hamblett could not confirm that was true. "The district is in the midst of an investigation to better understand the context of the worksheet in the classroom and to determine next steps," he said. In the meantime, the principal of Valleyview met with DeFouw to address his concerns, and the father appears to be satisfied with their response so far. He wrote on Facebook that he's "really proud of our school administrators" for their handling of the situation. "All parties involved have been great to deal with and are earnest in their effort to find a resolution," DeFouw said. The B.C. Ministry of Education and BC Teachers’ Federation both told CTV News they are looking into the assignment as well. The minstry said it has been assured the worksheet will no longer be used in Kamloops-Thompson School District classrooms.